2. 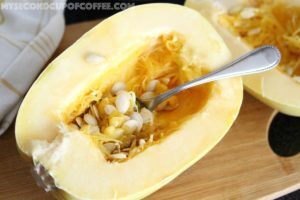 Scoop all the seeds out of your squash with a spoon or your hands. 4. 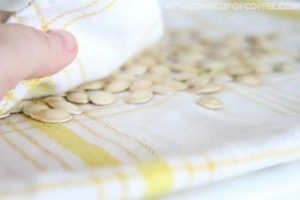 Dry the seeds with paper towels or regular towels. 5. Toss the seeds with oil (I used canola). 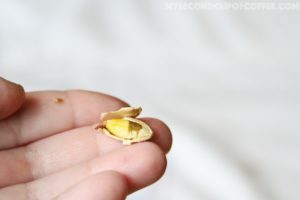 How much you use will depend on how many seeds you’ll end up with. 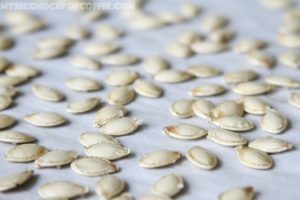 You don’t want to overcoat your seeds so they don’t end up too greasy. 6. 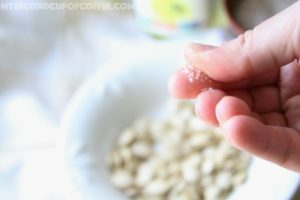 Sprinkle your seeds with sea salt. I didn’t skip on salt, just to make sure my roasted squash seeds will have some flavor. Some salt fell off afterwards and so don’t be afraid to season it well. NOTE: I yield 1 teaspoon of oil for 1 cup of seeds. 7. 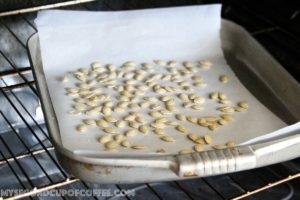 Spread your seeds in one layer on a large roasting pan or cookie sheet. I lined up my pan with parchment paper just to avoid possible sticking. 8. 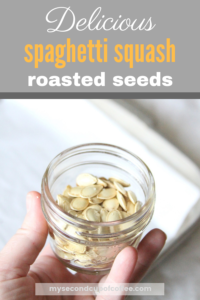 Roast your squash seeds for 15 minutes and start checking after that. My oven is quite old and spotty, so it ended up being 25 minutes for me, while checking every 5 minutes after that first 15 minute mark. 9. As soon as your seeds start turning light golden, it is probably a good sign they are close to done. Keep in mind that after you pull the seeds out, they will still keep cooking for a few minutes as they cool. Pull them out and let them cool. 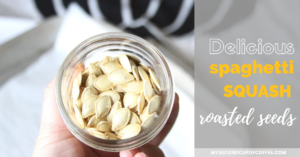 Keep your roasted squash seeds in an airtight container in a cool dry space for months to come. 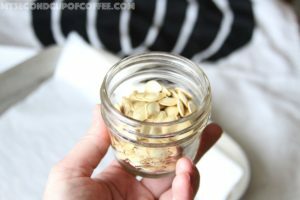 I like putting my roasted squash seeds (pumpkin or any other) in small glass jars as great options for snacks. Because the jars are small, there is less risk of accidentally leaving the jar tops off and getting some moisture in. 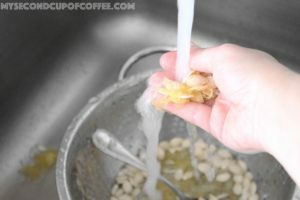 If you do so, your roasted squash seeds might get all damp, soggy, and bitter. And that is exact opposite of what you want your delicious roasted treat to be: a crunchy, filling, and comforting snack. 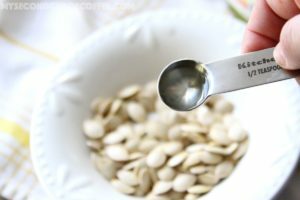 I hope you got inspired to try to roast some new seeds this fall. If you do, come back and leave me a comment telling how it went! I’d love to hear from you!